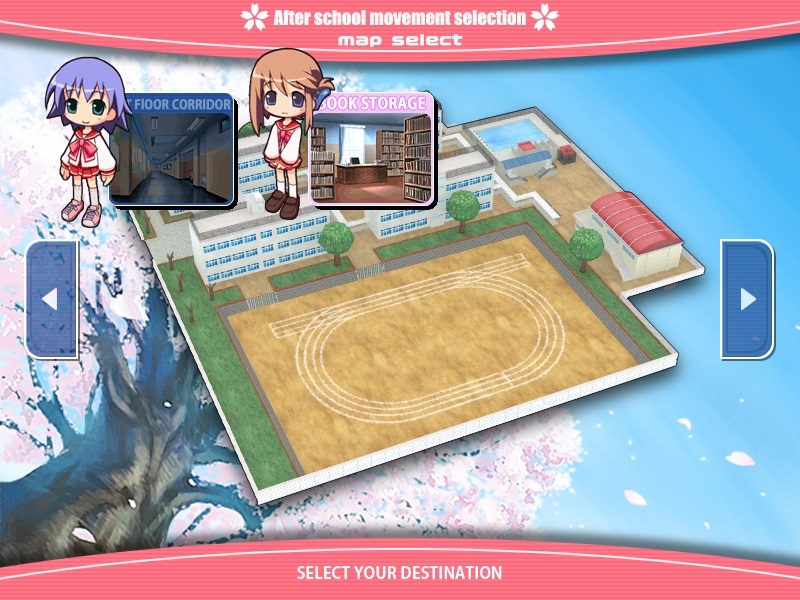 Aquaplus, and by extension their eroge-centric subsidiary Leaf, is a long-time respected player in the visual novel market, as well as certain areas of gaming in general, behind such series and games as Utawarerumono and White Album 2. With Utawarerumono becoming relevant again due to recent sequels and an upcoming remake and spin-off – as well as this game’s fan translation recently having been finished after years in the works – I figured it would be a good time to look back at one of their most successful games, To Heart 2, initially released in 2004 on PS2 and most recently on PS3 in 2011 as To Heart 2 DX Plus. More specifically, I’m looking at its 2005 18+ PC version, To Heart 2 X-Rated, the only 18+ version of the game to date. Similar to Little Busters! Ecstasy, this is a game that started as all-ages with the H-scenes added in a later version, so I was interested to see how it would fare by comparison. Get ready to basically stalk whoever you’re trying to romance. 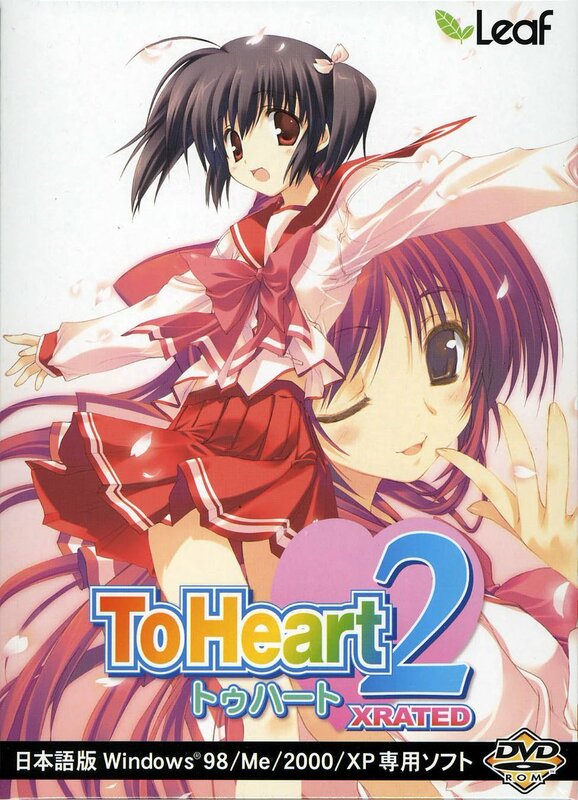 To Heart 2 follows high school student Takaaki Kouno (he can be renamed in the Japanese versions, but that’s seemingly not supported in the fan translation) as he finishes first year and goes into his second. He comes with his childhood friends Konomi Yuzuhara and Tamaki Kousaka, the reserved class representative Manaka Komaki, Manaka’s competitive and energetic friend Yuma Tonami, the close twin sisters Sango and Ruri Himeyuri, the pushy Mystery Association president Karin Sasamori, the strange Ruuko, the mysterious Yuki Kusakabe, and (added in the PC version) the seemingly authoritative and unapproachable Sasara Kusugawa. That’s nine routes in total, with Ruuko and the twins’ routes unlocking after you finish one route and Yuki’s unlocking once you finish two. When I first started, most of the characters didn’t immediately appeal to me; however, each character’s route did well at selling the character to me, and ultimately I ended up liking all of them, with none of the main characters standing out as particularly weak to me. 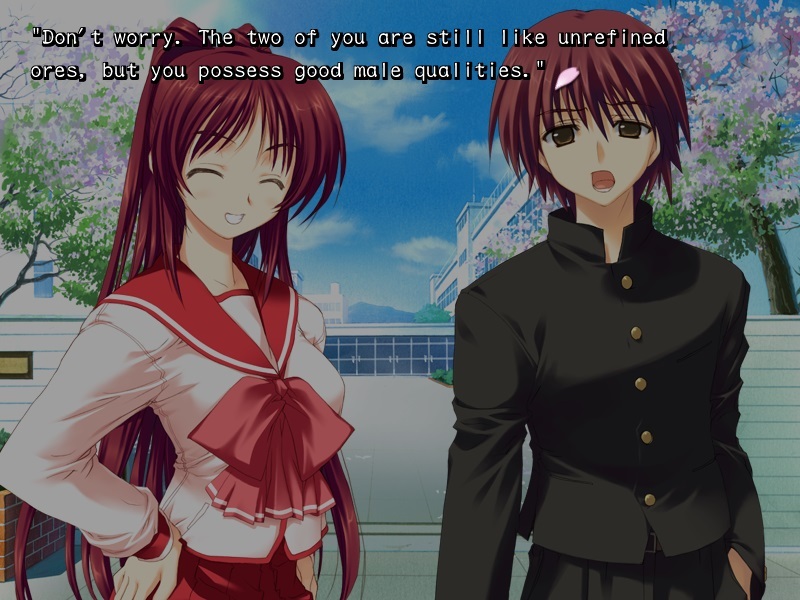 The only major side character who isn’t mainly restricted to a single route is Tamaki’s brother and Takaaki’s best friend Yuuji Kousaka, although some of the lesser side characters are entertaining as well, most notably outgoing student council president Ma-ryan who appears in Sasara’s route. Sounds like a real horrible nightmare. The stories are all generally pretty grounded romance, with Takaaki helping the heroine(s) to sort out their problems and developing their relationship along the way. That being said, there’s the occasional appearance of light science fiction or otherwise more outlandish elements, such as the occasional robot appearing throughout or the entirety of Ruuko and Yuki’s routes, giving the subtle hint that there’s more to the world than there first appears but never building beyond the simple implication. Other than that, the stories generally revolve around Takaaki getting over his discomfort around girls and generally dense personality to develop a relationship and romance with whichever girl he ends up with. Fortunately, although Takaaki can be dense, it never quite reaches the same destructive peak as Da Capo II’s Yoshiyuki Sakurai, so for the most part it’s not as frustrating to watch as it could be. The stories are still entertaining to read, even if they don’t carry the same emotional weight as some other games. They’re well-written and well-translated (as one might expect for a project 10 years in the making), aside from a small number of minor typos throughout. It was heartwarming to see the characters develop and grow, both the heroines and Takaaki himself, even if he was frustrating to watch as he stumbled along at certain points.